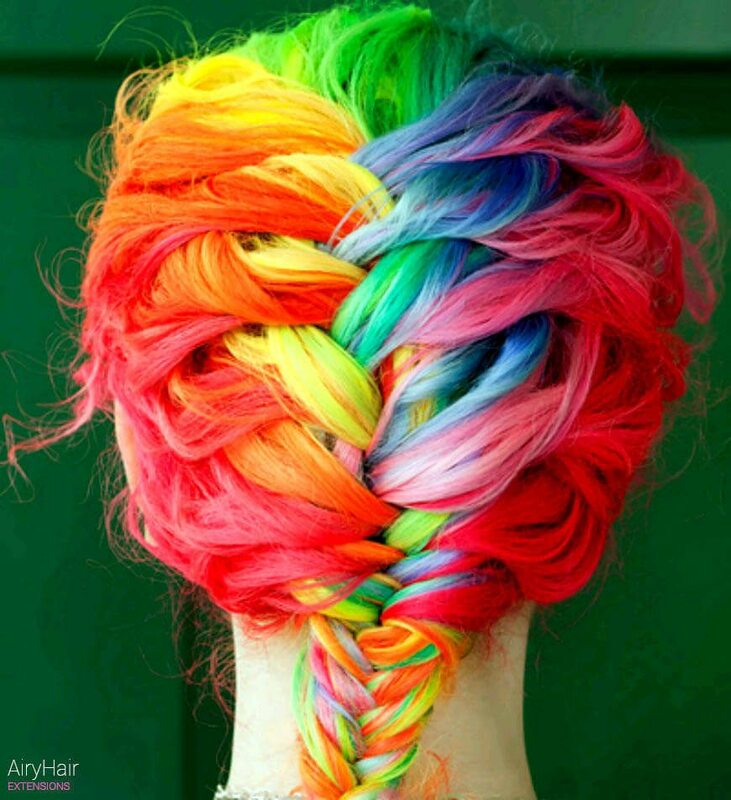 The Most Creative & Simply Amazing Rainbow Hairstyle Ideas. 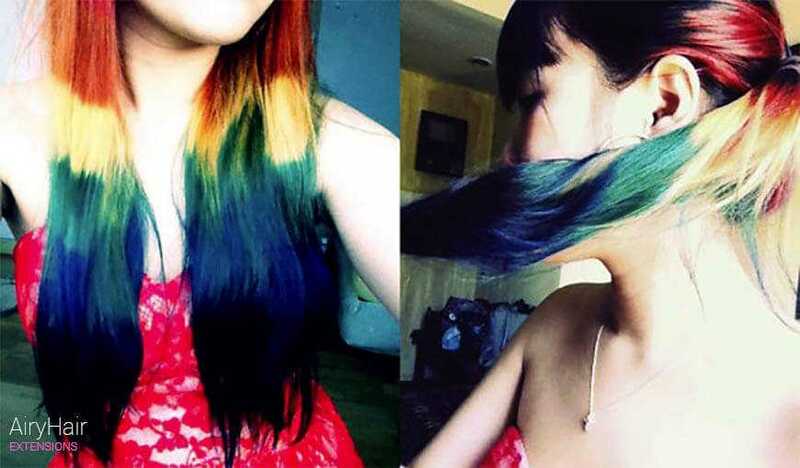 Below, we will list some of the absolutely crazy and trippy rainbow hairstyles. 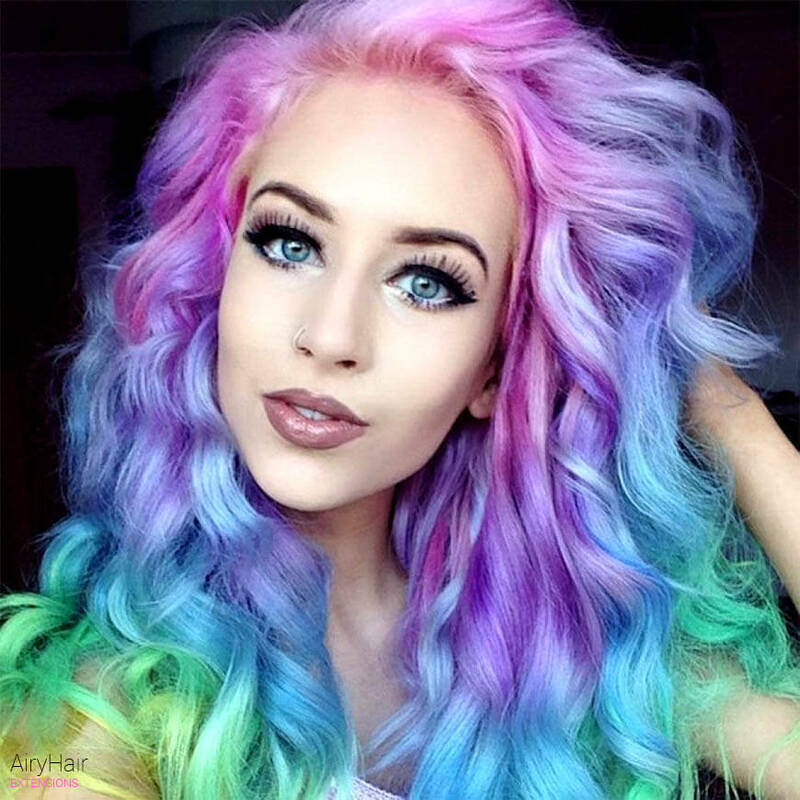 From light to high contrast colors, hairstyles and color ideas that will inspire to do something absolutely crazy with your own hair. 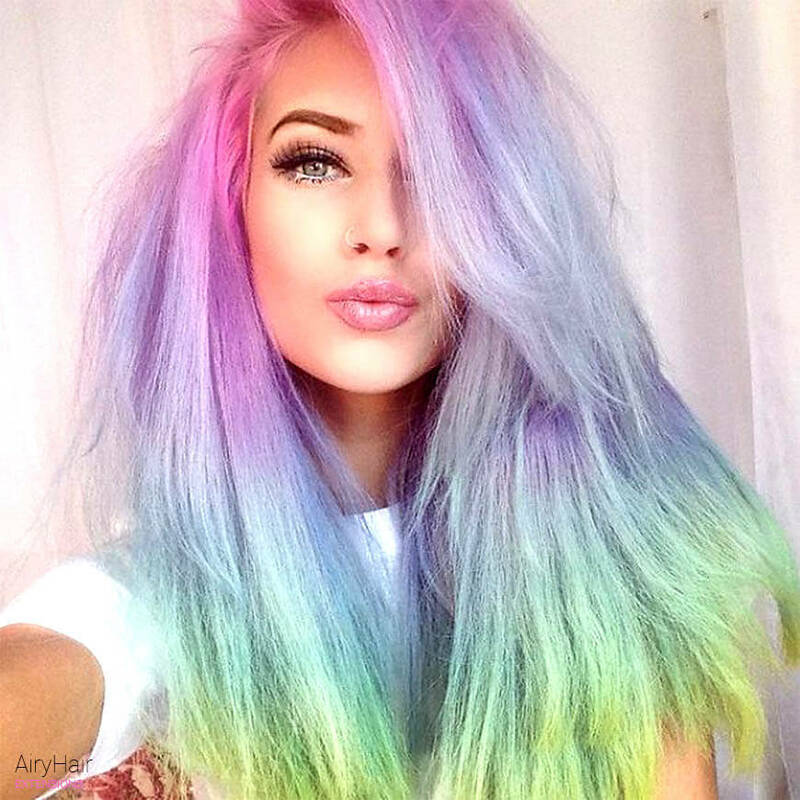 Don’t feel like testing these colors on your own hair? Order some hair extensions! 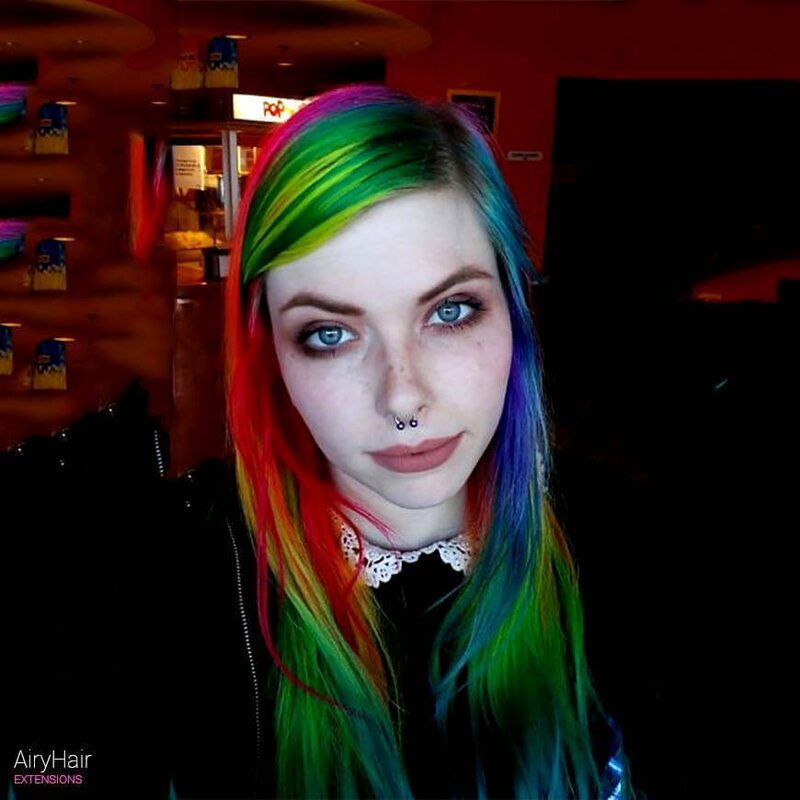 One of the most popular pictures on the Internet for rainbow colors. 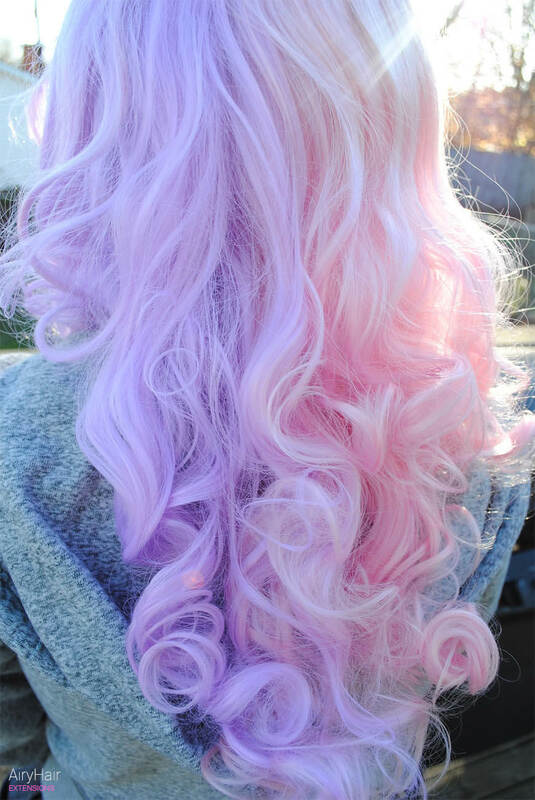 It’s a blend of various pastel colors. Do you think that’s too much? You don’t have to mix all colors in the world to have a beautiful look. This one uses all the blue tones and achieves a marvelous result. 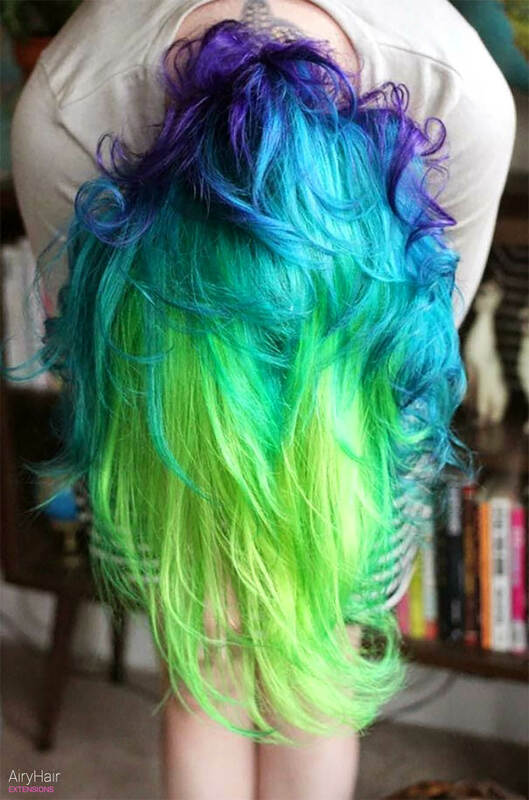 What if you were to leave the top part untouched and dyed only the bottoms? Preferably with some of the brightest dyes ever. 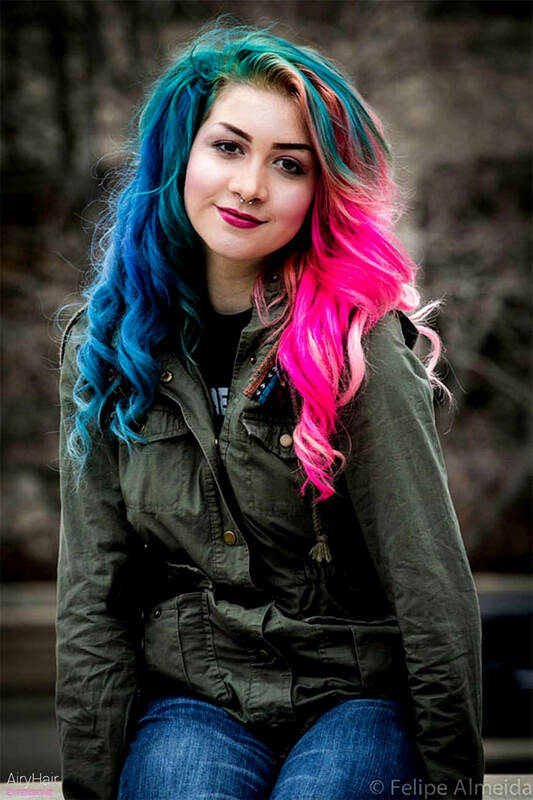 An interesting take on the split-color hairstyle. You can’t help but want to snag a photo or two of this one. Looks fun and glorious. Tone down the curls from the first picture and you got yourself a much better look. Beautiful magenta and green colors, all blended evenly. 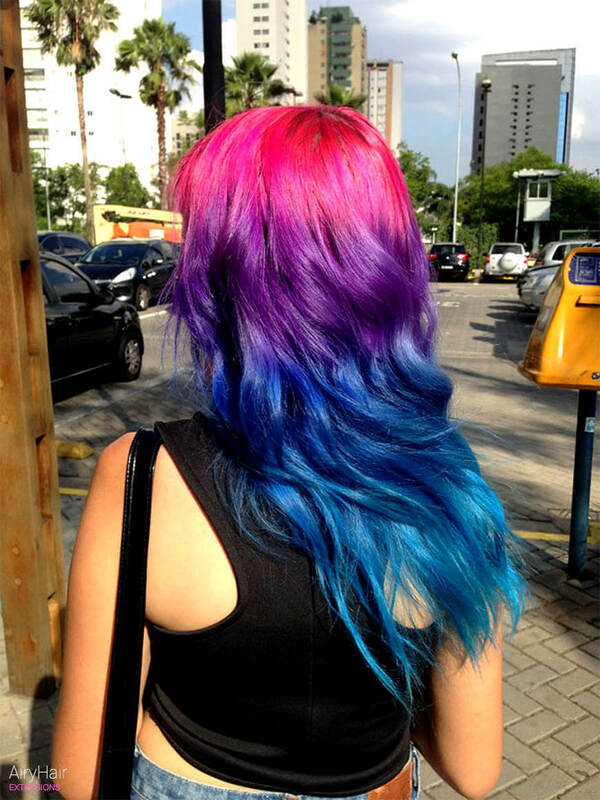 A dip-dye technique for a mix of four different colors. Bright blue at the bottom, followed by sea blue, fuchsia and lastly, pink. Oh boy, now this one is as hard to pull as an idea first impression. 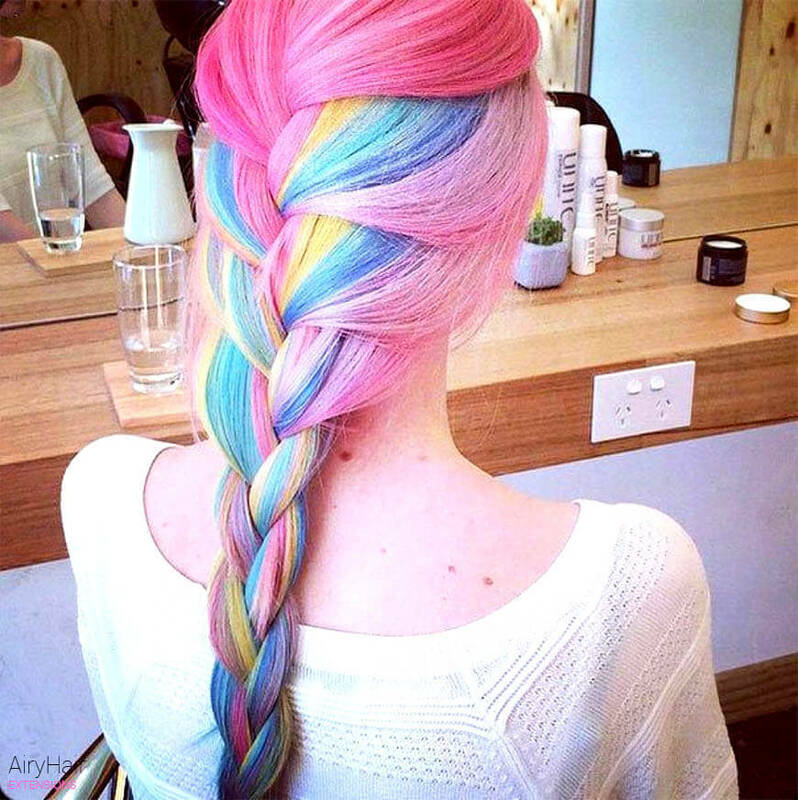 Some of the most impressive braids of any rainbow combination. What if you take less bright colors and play with this pastel combination? While still extremely hard to achieve, this one at least looks manageable. At least with hair extensions. Not sure if I like this one, as it’s bit random. However, who am I here to judge? It’s a trippy combination of violet, pure yellow and other tones. This is how angels dye their hair. Absolutely spectacular, truly awe-inspiring hairstyles. All without damaging your own hair! 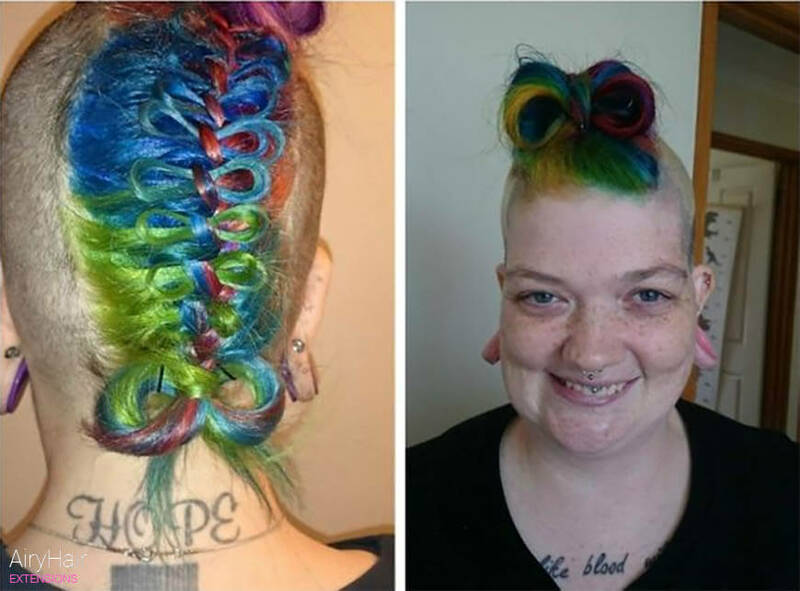 A bizarre looking rainbow haircut for trendy and edgy females. She seems happy and we are happy for her. 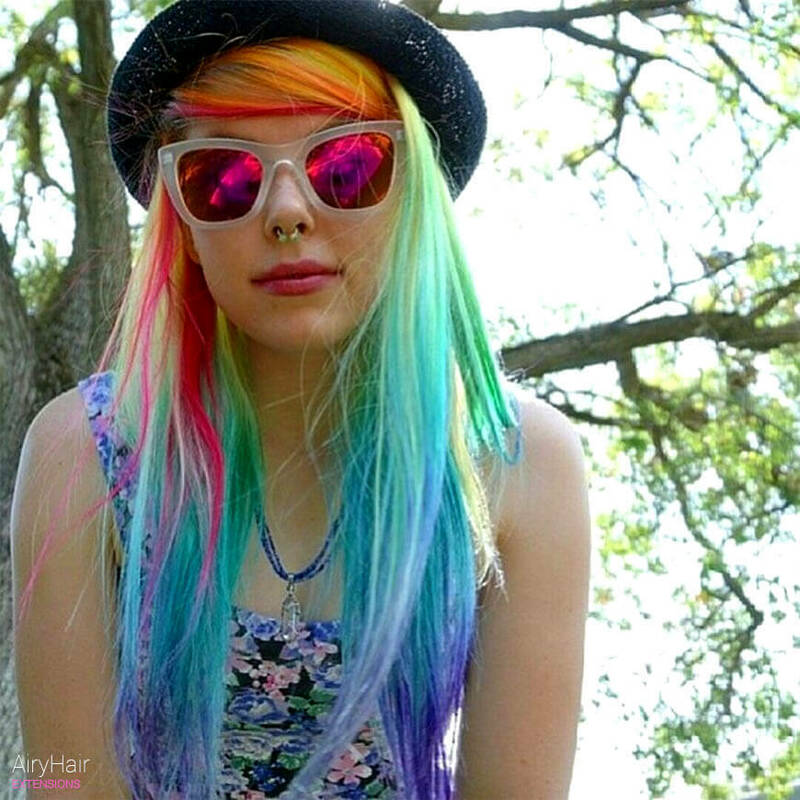 There are over 20 pictures of rainbow hair colors, with or without extensions. What about one for dreadlock owners? Here it is! 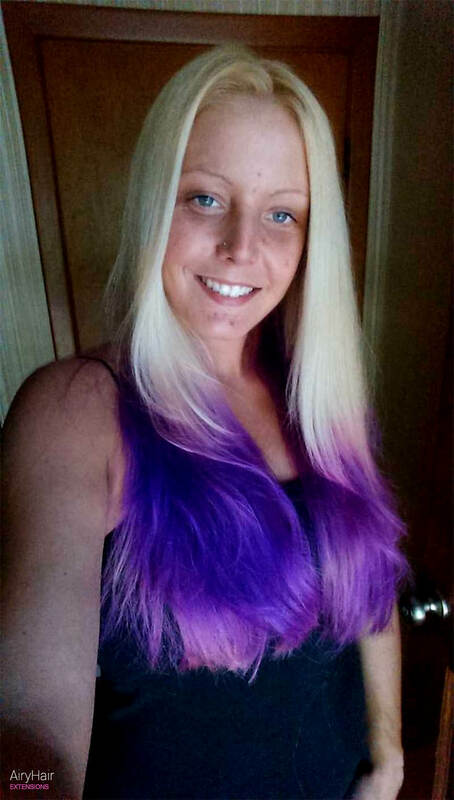 Another dip-dye technique using a bright violet hair color. Looks almost fake, and maybe it is. Nonetheless, an interesting take on two tones. Without going too extreme, this girl has reached the stars and went above. It’s the whole universe in a single picture. Lip piercing also helps to bring it all together. This one doesn’t even look real, and we mean that in the nicest way possible. She has managed to pull a stunning look, while still appearing “normal”. Here’s a good example of clip-on color highlights. 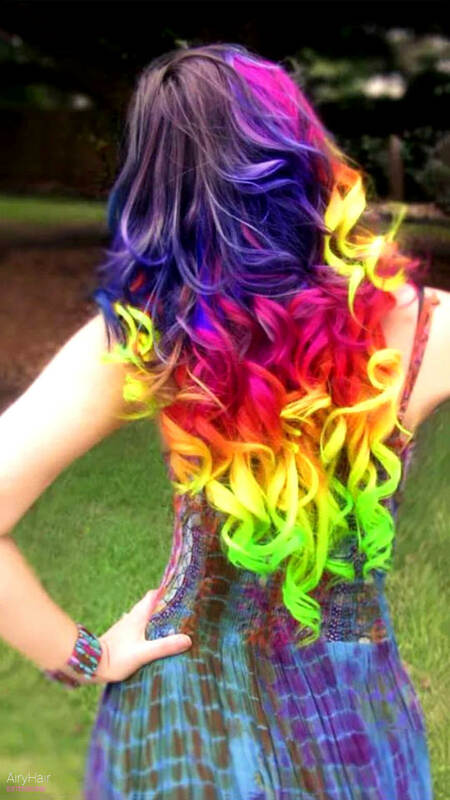 You add a strand or two of different colors and can switch these colors based on your mood or even. 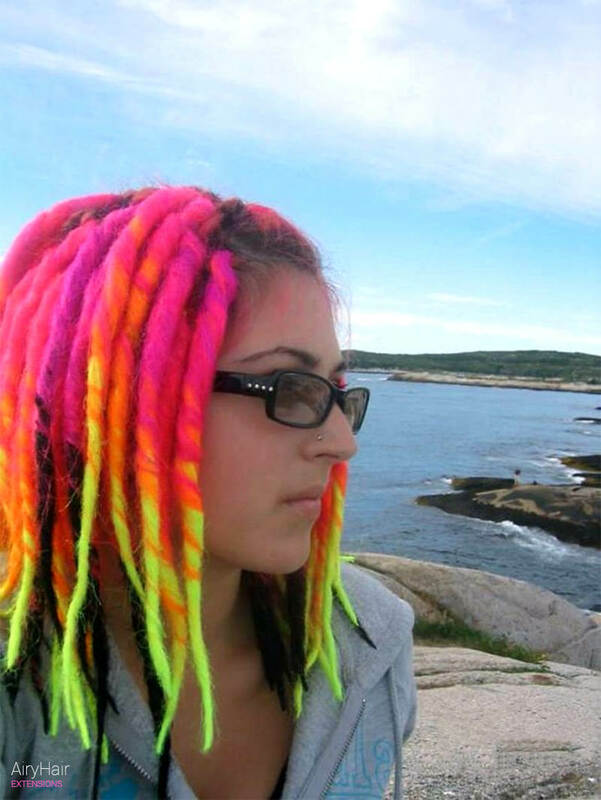 We are still struggling to figure out if this is one of the worst or greatest hairstyles. 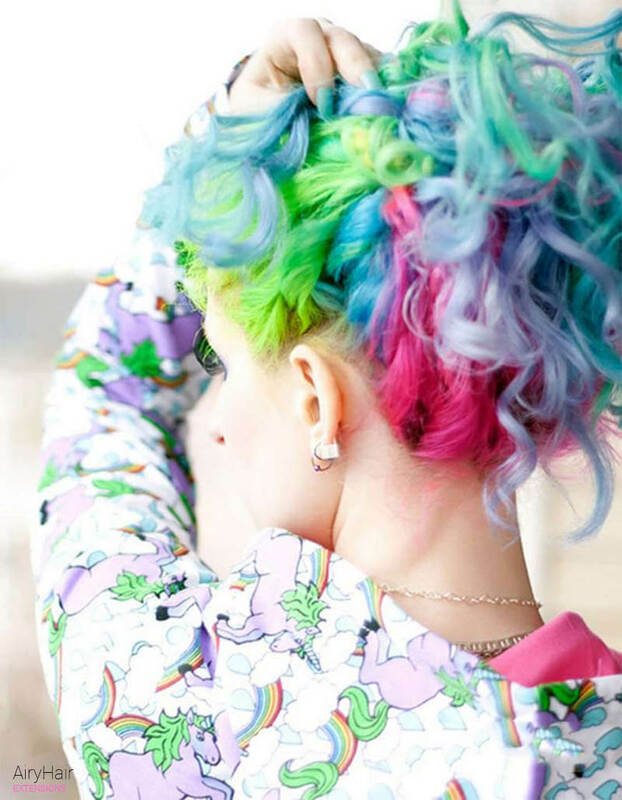 It truly resembles a rainbow and the effect quadruples after a ponytail twist. Here’s one for the mermaids. 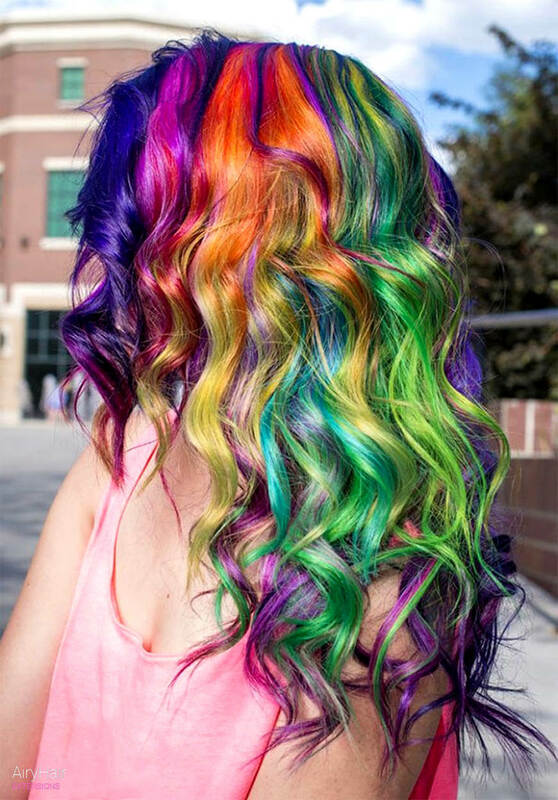 Long, beautiful hair that I would not dare to touch myself with so many colors. Maybe it’s wiser to use a hair wig or few extra strands. 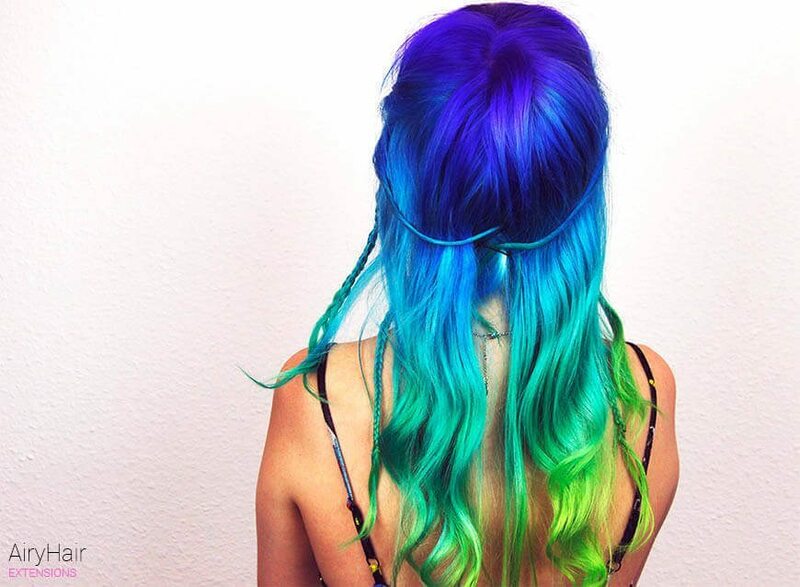 It might be the nose ring or pale white skin, but this is one of the best-looking hairstyles, ever! Despite bright colors, it fits her perfectly. 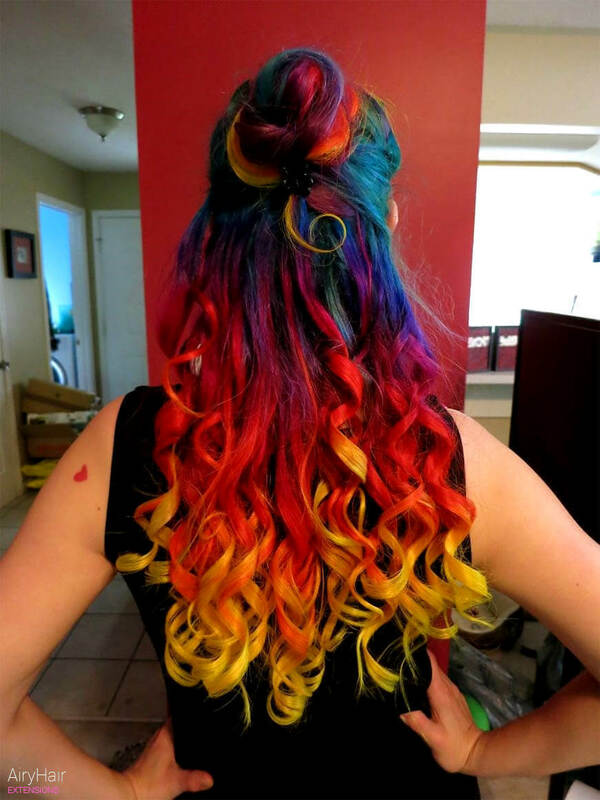 The bottom part of this hairstyle looks like a never-ending fire. Beautiful and eye-grabbing. Travel further and you are left with galaxy hair colors. A simple, playful and at the same time hard to achieve look. 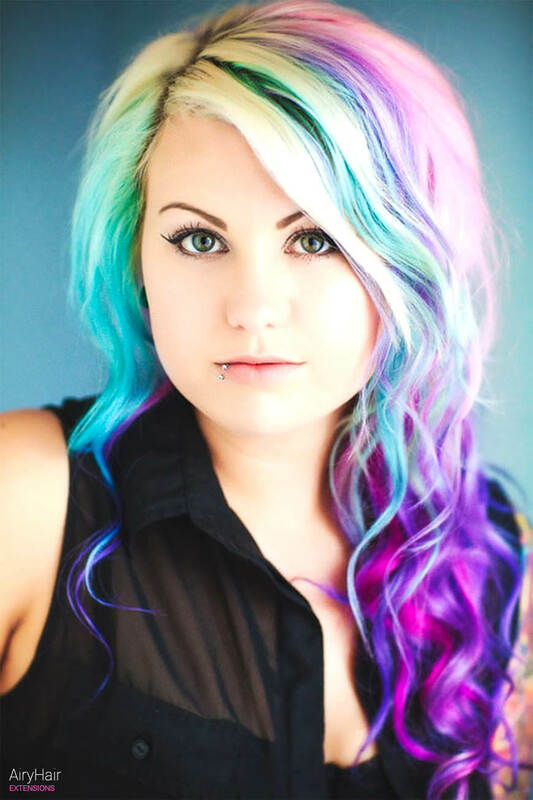 If you want to have less highlights, add a weft or two of different color clip-in extensions. 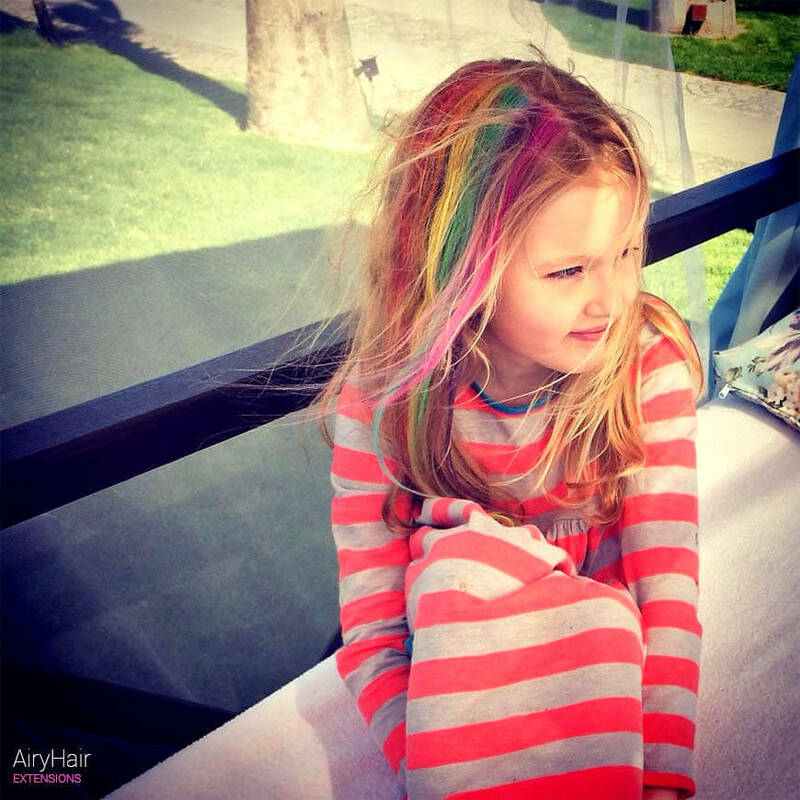 Look how happy one can be with rainbow weaves. 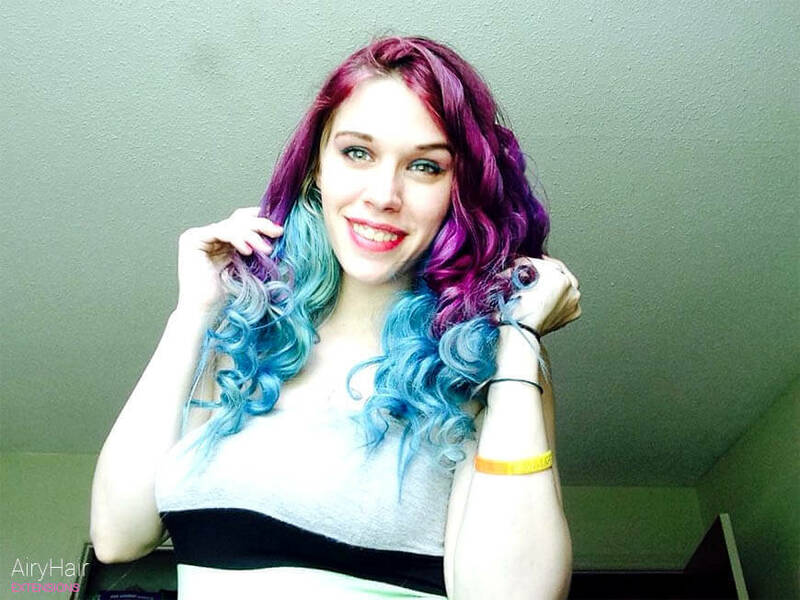 Just three colors, but thanks to the curls, results are spectacular. Would you agree? 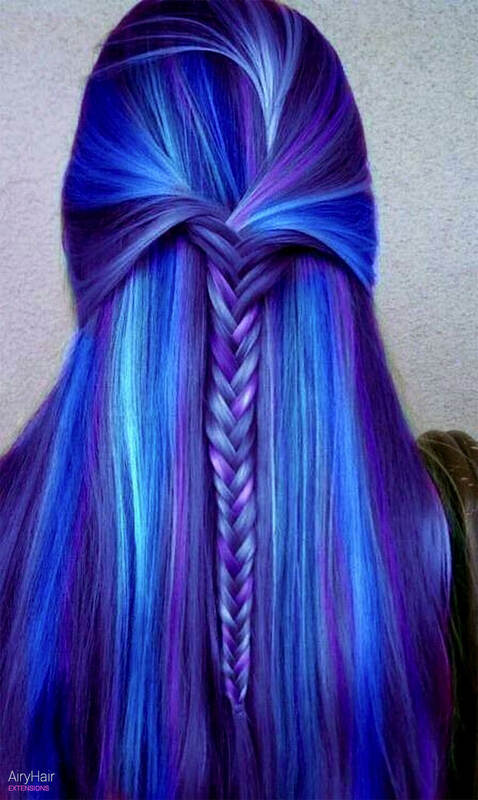 This one mixes sea green with violet and blue hair colors. One of the smoothest transitions we have ever seen! Perfect to experiment with hair extensions. Enhanced and Hosted by AiryHair Team.